The Flyers, fading fast in the Metropolitan Division, are getting ready to start their only California trip of the season, and some of the players think it's coming at a perfect time. "It's going to be our most important trip of the season," said high-scoring winger Jake Voracek, whose team has lost eight of its last nine games. "Last year, one of the reasons we made the playoffs is because we were successful on that road trip, and I don't see a reason why we shouldn't do the same thing." Last season, with many of the same players, the Flyers won two of three games on a difficult West Coast swing - including a 2-0 victory at Los Angeles, the eventual Stanley Cup champion - and it started their surge toward a playoff spot. On Tuesday, when the Flyers (8-12-3) begin a three-game trip at San Jose (11-10-4), they won't even be thinking about playoff implications. For one thing, it's much too early in the session. For another, they're just hoping the trip galvanizes the team and gets it back on track. "We have a real good test coming up," said defenseman Nick Grossmann, mindful that last year's West Coast trip keyed an 8-2 run. "We've dug ourselves in a hole here and haven't played our best, so it's up to us to get out of it." "We keep saying we have to be more consistent, but it's so true," winger Wayne Simmonds said. "Little plays make the biggest difference in this league." Coach Craig Berube said the Flyers "have to focus on positive things. I think it's good we're getting on the road - get away, get together as a team, and pull it together." The Flyers have lost their last seven road games, during which they have been outscored, 25-11, and they are seven points out of a playoff spot. Lately, they are losing board battles, allowing teams to spend too much time in their zone, and getting outhustled to loose pucks. "It's really evident that we're not skating like we can and not making plays like we can, with speed," Berube said. "It's confidence, a lot of it, but they have to find it. It's my job to help them get it. . . . You've got to man up and win hockey games." R.J. Umberger has no points in his last 16 games, a career worst. 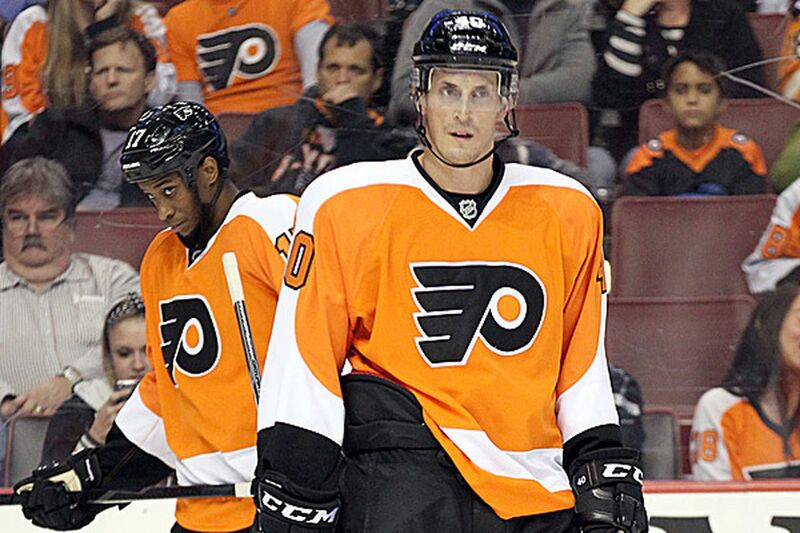 Vinny Lecavalier has no goals in his last 12 games. Sean Couturier has no goals in his last 10 games. Matt Read has one goal in his last 16 games. Simmonds has one goal in his last nine games. Brayden Schenn has one goal in his last seven games. "I haven't lost any faith in this team, but with saying that, we are not happy," said general manager Ron Hextall, who continues to work the phones for a possible deal. The Flyers are tied for 14th out of 30 teams, averaging 2.65 goals per game; they are 26th in goals allowed per game (3.09). . . . Voracek is second in the league with 32 points, one behind the Penguins' Sidney Crosby. Claude Giroux is sixth with 27 points.